The more prevalent mixture of tradition and imagination in wedding planning maintains the principles of marriage while personalizing and individualizing each ceremony. As customs and expectations change, brides find that a church ceremony does not have to be formal and are able to interject more and more touches of originality and uniqueness. Pew decorations are just one of many ways to set your wedding apart and here are a few ideas that can display your personality, are a great way to spend time with friends and will save money and keep you within your budget (hopefully). Use photography to tell a story in place of the traditional bows or ribbons. On each side of the aisle, use pictures to illustrate various stages in your lives, beginning in the back and ending nearest the altar with a current snapshot. An alternative is to use photos of you and your fiance throughout the course of your relationship to share some of your special moments with your friends and family. Both of these give all of your guests (especially those who may not know you so well) insight into your personalities and the journey that has led you to your wedding day. Get creative. 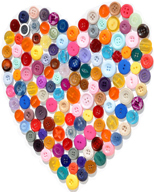 Use buttons of different sizes, colors, shapes and textures to make hearts that will adorn the pew ends. You can easily glue the buttons onto pieces of paper or fabric swatches, frame each of them and hang them from the pews using pieces of ribbon. They add beauty and modernity to the ceremony site and a very special touch because each of them will be unique and different from the others. Potpourri balls are another innovative option that can be done in more than one way while simultaneously filling the room with a wonderful scent. A way to combine the more traditional notion of flowers with the potpourri balls is to leave them bare so that from a distance, they look like small bouquets on each pew. Alternately, there are many varieties of round containers, ranging from very simplistic and unadorned ones to those that are ornate and have elaborate cut-outs, depending on the formality of your ceremony. Either way, the space will smell as lovely as the contribution the balls will make. While the overall experience and the significance of a marriage are, by far, the most important aspects of your wedding day, many brides get caught up in the details because those are what make the occasion even more special. With just a little bit of forethought and imagination, the pew decorations can be both memorable and tailored specifically for (and perhaps by) you. This entry was posted in Ceremony, DIY, Ideas and tagged decorations, DIY, pew decorations, pews, seating on October 10, 2012 by admin. Churches are a place of peace and calmness and make a perfect location for a wedding. When it comes time to consider decorations for your wedding, careful detailing and selection of appropriate decorations is essential. You can create a glamorous ambiance and something unique for your ceremony and save money at the same time. There is no need to make it look terribly extravagant, as the whole point of having it at the church is really to embrace the religious aspect – this makes decorating it that much easier. Here are some unique and different ideas that don’t cost a lot and will set your ceremony apart from others you may have attended. The first idea incorporates the invitations and a little forethought. Send your guests paper leaves inside their invitations with their names printed on them. Then, purchase a small tree with only branches so that when your guests arrive, they can place their leaves on the branches of the tree. That way, you will not only have a beautiful decoration but the decoration will act as a guest registry as well. Make sure to focus a lot of your decorations on the front part of the church. This will allow you guests to experience your décor while they watch you and your partner marry. Use potted plants instead of fresh flowers. After the ceremony is over, you can give them to your wedding party or to your or your husband’s parents so that they can be replanted as a reminder of the day. The plants will grow as your relationship continues to do the same. Use LED candles in lieu of regular candles. Many venues don’t allow customary candles so LEDs are a perfect solution. Not only are they less expensive than normal candles but they can be used again and don’t make a mess. The atmosphere they create is unique and intimate. Typically, families sit in the first few rows during the ceremony. There are a number of ways you can decorate these pews that will add to the beauty of your overall theme. Pew bows are the most traditional decoration. They can be made with tulle or ribbon accented with flowers to compliment your wedding theme. Other ideas are floral swags, wreaths and floral balls. A more unique idea is to find paper lanterns that match your color scheme to decorate the pews. You can attach them with ribbon and even put LED lights inside of them to make them look even more beautiful. Set up a small table near the entrance. Cover it with a table cloth that compliments your color scheme. Set up a photo of you and your finance. Set out the guest book and some fancy pens for guests to use. Also put a small flower arrangement together and place it in a vase and set it on the opposite side of the photo so the table is balanced. Beautiful church decorations help create a more celebratory and refreshing atmosphere to make your special day truly memorable. Use of any of the ideas mentioned will give you a gorgeously decorated church for your wedding. This entry was posted in Advice, Ceremony, Ideas and tagged ceremony, decorations, ideas on June 20, 2012 by admin.